Japan'ssolar sail ? a sun-powered spacecraft launched in May ? 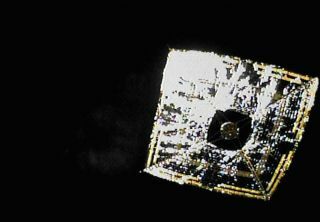 hassuccessfullysteered by using just the pressure of sunlight against its squarepolymer sail,Japan space officials said. The JapanAerospace Exploration Agency spacecraft Ikaros now representsthe first solar sailto have harnessedsunlight for bothattitude control andpropulsion, after it first launched May 21 alongside the Venus-boundorbiterAkatsuki. Liquidcrystal panels on the edges of the sail can change their surfacereflection ofsunlight by using low amounts of electricity to turn on or off. The"on" setting creates a mirror-like reflection that pushes thespacecraft forward, while the "off" setting has a more diffusereflectionthat redirects the pressure of sunlight in all directions, lesseningthe forceagainst the sail. That allowsIkaros to slowly change direction based upon the different pressures ofsunlight reflecting from its edges. Mission controllers have to accountfor thesolar sail's spin rate, distance to the sun and the sun angle to plot thespacecraft's course. An almostday-long test of the steering took place between the early morninghours ofJuly 13 and July 14. Mission controllers achieved more than 90 percentof theirexpected attitude control angle. "JAXAwill continue the attitude control experiment by the Ikaros to evaluatethedetails of the attitude control performance while continuing to conductresearch on attitude control technology using sunlight pressure as atechnologythat enables navigation for longer in time and further in distance by asolarsail," JAXA officials said in a recent statement. That effortwas also briefly described last week at the second InternationalSymposium onSolar Sailing at the New York City College of Technology in Brooklyn,whereresearchers hailed the solar sail'ssuccess. Suchattitude control does not use any additional propellant, which may helpmakefuture solar sails more self-sufficient. Ikaros also relies uponthrusterslocated on its main body at the center of its sail to move around. The solarsail also carries solar panels that have successfully generatedelectricity,even if it cannot use the solar-generated power for itself. JAXAenvisions Ikaros as the first step toward a future solar sailmission to Jupiter andasteroids that couldfly in 2019 or 2020, said Junichiro Kawaguchi, JAXA program manager,during thesolar sail conference.